I have avoided the GPS watch craze for the past few years that I've been running. Trust me, I like data and being able to compare my progress in my running against benchmarks but there is a certain allure in "running naked." In fact, I have not run with a HRM for two years and so my trusty Polar 625x has been relegated to a glorified stopwatch. 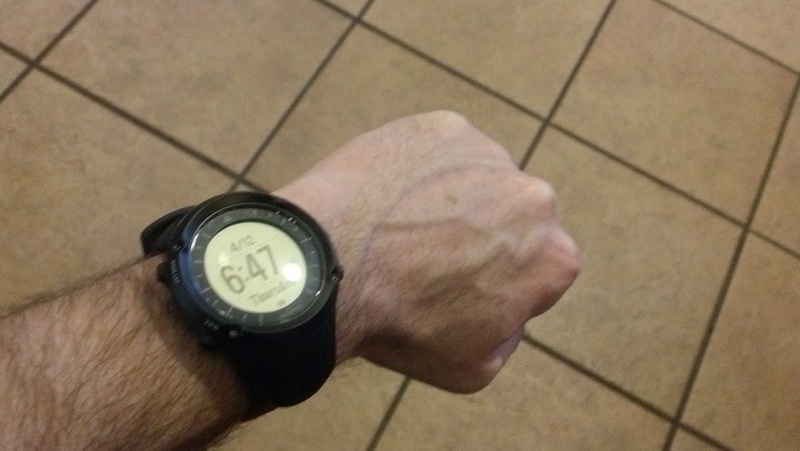 The new Suunto Ambit, however, has made me reconsider the GPS watch space. I was initially drawn to it's ability to navigate to waypoints, but the promise of a longer battery life was intriguing as well. Well, the new toy arrived yesterday and I thought I would write up my initial thoughts. I am not a GPS watch user so I have no basis of comparison other than what I've heard from my running buddies. Based on one run through a reasonably dense canopy the GPS itself seems quite good. 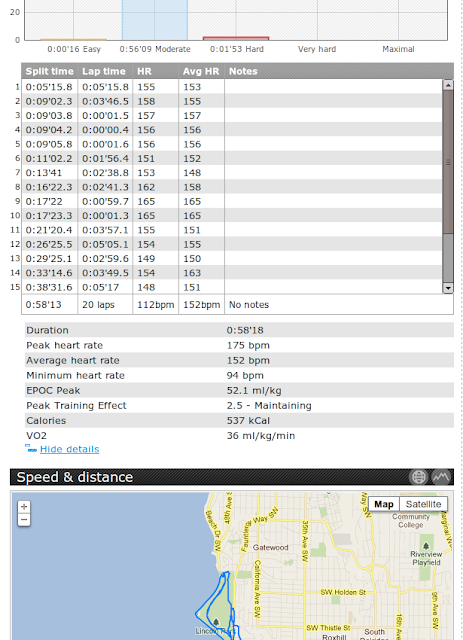 I like the detail I get post run and am happy not to have to plot my routes on gmap-pedometer. The extended battery life is a bit of a red herring. In "normal" mode you track GPS and record every second. You can change the options so you record every 10 seconds and do a GPS fix every 60 seconds but of course you lose a lot of detail. What would seem logical is to give me a choice between 1 and 60 seconds so I could tune my watch to the distance I plan on running. I will have to play to see how far I can get on the "high" settings - Suunto claims 15 hours which would satisfy the demands of a 50k or 50 miler. I also understand you can charge the unit while you run so if you had a portable charger you could extend battery life at the higher settings. I clearly have some testing to do in this area. There are ZERO options to define exercises on the unit. This actually concerns me the most as with the Polar you could create reasonably rich exercise profiles. One of my current goals is to do more HR-based training but I don't have the option to define exercises with intervals that work different zones. This seems a huge oversight to me in such a device. You can work around this limitation by defining multiple "activities" (more on this in a second) but the options are limited to one HR zone and no intervals. Creating activities is cool but time consuming. There is a lot of data that the watch displays or can display (25 different metrics). What is really slick is you can define, per activity, what is displayed on each screen (including elevation and HR profile graphs, as useful as that may be). With all this customization comes the price of "time to setup" which is not insignificant. I will also be testing out what I want to see on said runs and I suspect I've given myself information overload to start and will be winnowing down what I want to see as time progresses. Still, you have a great tool in Movescount that allows you define this all rather easily. The watch is a nice size - much smaller than the Garmins I've seen and about the same size as my Polar. It's bulky as an everyday watch but certainly not something you would only wear when exercising. Of course I live in Seattle so take that fashion advice with a grain of salt. I did keep hitting the "stop" button fiddling with the watch while running. There is a key lock feature I was not aware of before I went out so that should satisfy this problem. Also getting familiar with a new watch with different button placement will resolve this issue over time. The altitude does not auto-configure so you need to know your starting altitude or atmosphere pressure (um, yeah....) and reconfigure from time-to-time. This is no different than my Polar which also has altitude on it. The Running activity includes an auto-lap every 1k. Lame and annoying on the first run. The first thing I did when I got home was to reconfigure that setting. 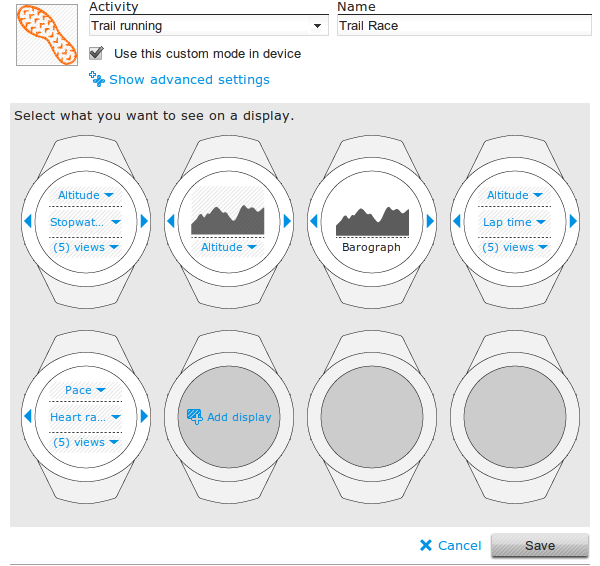 Which does bring up an interesting point: you have to configure most of these settings on the watch from Movescount. I suspect this will not be a long-term issue (and, seriously, a first world problem if there was one) but it is interesting you cannot change these settings on the fly from the watch itself. Movescount seems ok. I struggled with this as I like the Polar desktop tool and prefer to have all my data myself v. uploaded to a website. I like all the data I get and could do analysis on it all day long probably. My big gripe is they seem to base all movement on SPEED and not PACE. Makes sense for cycling; not so much for running. Overall it's a really great watch. In the grand scheme I have no complaints - it's a clear upgrade from my Polar but may not be an easy upgrade from an existing GPS watch. I do hope that the upcoming firmware updates address some of my concerns and will be contacting Suunto support to see what they say about this. 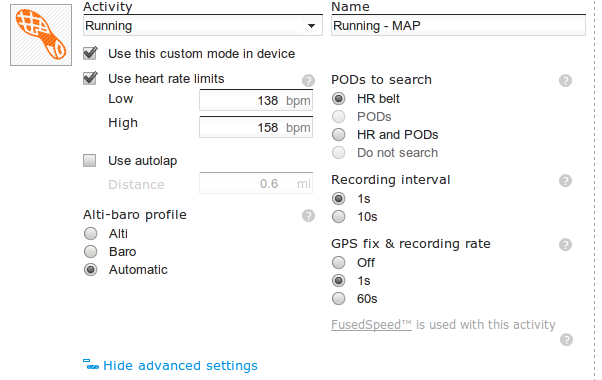 Of everything missing I'd really like to see two areas improved - more configuration of GPS / record settings and the ability to define different exercises / workouts.